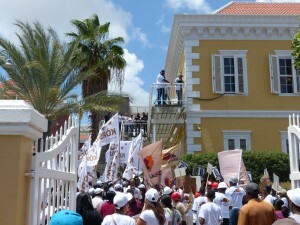 WILLEMSTAD - In accordance with article 12 section 2 of the political party financing decree (A.B. 2010 # 87) all persons appearing as candidates on one of the 13 ballots during the election of October 5, 2016, must present to the Supreme Electoral Council (SEC) a declaration if they have received gifts or donations during the period of August 8 until October 5, 2016. On July 4, 2017, the SEC informed the Public Prosecution that on that day, 48 of the 331 persons that appeared as candidates on the 13 ballots that participated in the elections of October 5, 2016, did not turn in their declaration to the SEC. Between July 4, 2017, and August 15, 2017, the SEC received 20 declarations from these candidates. This means that on August 16, 2017, there were still 28 candidates who did not comply with this regulation. The SEC, after consulting with the Public Prosecution, decided to formally file a complaint against these 28 candidates, in accordance with article 18. This took place on August 18, 2017. Article 21 of this law stipulates that non-compliance of article 12 section 2 is considered as a violation and is punishable by a maximum of 10,000 guilders and/or a prison sentence of maximum 3 months. SEC understood from the Attorney General that these 28 former candidates will receive a letter from the Public Prosecution giving them one more chance to comply with article 12 section 2 of this decree before filing a lawsuit against them. This is why the SEC urges all these former candidates that did not turn in their declaration to do so as soon as possible to avoid problems with the law. SEC also informs that these 28 candidates are from the following parties: MAN (2 candidates), Korsou di nos Tur (3), PAIS (5), Movementu Progresivo (2), PAS (2), Democratic Party (3), Pro Korsou (5) and PNP (6).